Your favourite photo or design on a custom iPad Pro 11 case with GoCustomized! Protect your iPad Pro 11 in every situation thanks to the personalised silicone case. The personalised iPad Pro 11 case is made for you! No matter where you are or the activity, the personalised silicone case will keep your iPad Pro 11 in pristine condition. At GoCustomized, we make sure to use the best materials to keep your device safe whether you are using it or not. This custom iPad Pro 11 case is made of silicone, absorbing shocks and protecting your device from scratches. The personalised silicone case covers the back as well as the sides of the device and the picture is printed with a UV printing method, using a scratch-resistant ink, making the case last for a very long time. Hence, with a custom iPad Pro 11 case, you won't have to be scared anymore! No need to be a designer or a professional photo editor. At GoCustomized, we made the customization process as easy and fast as possible. Only a few minutes are needed! First of all, upload your favourite picture. You can upload your photos from your Instagram or Facebook account, use your pictures stored in your computer or mobile phone and if you lack inspiration, you can even use one of our designs put at your disposal. Change the layout if you want to add more pictures or use our premade templates to make your case even more unique. Lastly, add some text, some stickers or a filter for the final touch. You are done! Now, you just have to place your item in the cart and proceed to the checkout to receive the custom iPad Pro 11 case you've ever wanted! 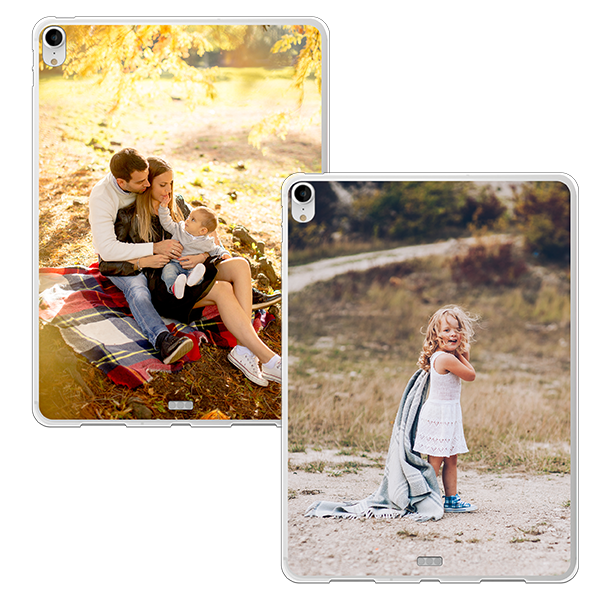 Once you are done creating your personalised tablet case, you can proceed to the checkout! Fill up your information, choose your payment and shipping method, and before placing your order, we kindly ask you to double check your information so you are sure to receive your order without any problem. Our production team will then take care of the rest! Any issue with your package or any question in mind? Feel free to contact us via our customer support. We will be happy to help you as soon as possible! So don't wait any longer and make your own custom iPad Pro 11 case now!